I am an essayist. Ever since I started keeping a journal when I was eighteen, I’ve thought in essay, in narrative, in truth. My life is offered back to me in the mirror of creative nonfiction, in finding metaphor and art in life and fact. I relapse into fiction once or twice a year (maybe like those younger-day mistakes I used to make during late nights when I drank too much and chased after the shadow of the moon). When someone tells me a story and I think, I need to let that story wander where it may. And I will follow along. During those short windows, I explore invention, fiction. The art of the empty stage: drama. A genre I’ve never studied. But the camera is so close, intimate, like falling in love, that first night. The hardest kiss. Or the night of the breakup. Nights alone. Though I don’t know drama, I understand the feeling aloneness on a stage, a hot beam illuminating our essential aloneness. I teach an intro level, multi-genre creative writing class at a small Vermont university. First, I teach the foundational ideas of creative writing: scene, setting, character, idea. Only then do I teach the four genres. Definition: Genre is a category of writing based on shape. The four major creative writing genres include poetry, drama, fiction, and creative nonfiction. Title: The Teaching of Genre in a One Act Play. Setting: A stage filled with twenty desks and twenty students. A professor, bald, 40ish, thin, walks across the stage. Classroom is filled with smiling, happy students and proud professor. Teacher paces in front of classroom. Is this confusion between truth and shape within genre merely a problem for the random professor? Merely an issue in the classroom? No. For this writer, there are a plethora of problems with our current system of how genre seems to use both shape and truth as its defining characteristics, that tries to meld together these differing ideas on what genre is, that offer only false borders. As a writer, I am stuck trying to explain my writing to editors, agents, readers, and publishers. I write micro-essays that look like poems. What do we call that? How will the reader know that these poem-like things are truths? How will they understand that truth is the heart of these pieces and the shape serves the truth I am trying to get at? My friend, Julia, calls these hybrid pieces that span shapes Thingamabobs, which just highlights the problem. Julia and I, and so many other writers, are forced to create unclear terms to try to define something that should be easily defined. We are writers. We work with language. How is it that we have no language here? And then there is the issue of bookstores. I read environmental and nature writing. When I go into a bookstore and search for nature writers, I look in the Nature Writing section. Easy enough. Unless I want environmental poetry. Then I need to go into the Poetry section. Here, I’ll find nature poets like David Budbill and T’ao Ch’ien kissing covers with lyric poets like Ezra Pound and ultra-talk poets like Mark Halliday and confessional poets like Sylvia Plath. These poets are lumped together for their reliance on line breaks, on their shape. This organizational system of gathering likeminded things together might tell us to call a house and a cardboard box the same thing since they share the same rectangular shape. Also, the reader often has an unclear understanding of what they will be receiving from the writer. Is that poem true, invented, or something else? What is the small paragraphy-thing? A prose poem? A lyric essay? What is the difference? We can be more clear with the reader. We can tell them exactly what they will be holding in their hands. Genre, or shape, is normally easy for a reader to see just by examining a piece of writing. Most poems clearly use line breaks. Most fiction and creative nonfiction clearly use paragraphs. But truth/fiction is not something that can be seen. It can only be told to the reader. Once the reader knows what they are reading (genre and truth/invention), then they can decide on how to use that information or if that information is even important. But right now we often don’t provide that information to the reader. Finally, as writers, we have been taught to write truth or fiction in prose, to often ignore truth or fiction in poetry and drama, and to see creative nonfiction as only prose. These are artificial limitations. These constraints hem us in for no reason. A poem can be true. Creative nonfiction can use playwriting techniques. Fiction can use historical information and fact. Drama can be true or invented. Etymology of Prose: Prose is birthed from the Latin word for straightforward. Prose uses paragraphs, sentences, and traditional uses of punctuation. Etymology of Poetry: Originated from the Latin word for poet, poetry originally meant maker or author or poet. Etymology of Drama: Drama comes from the Greek words for to act, to perform, to do. Etymology of Genre: Originates from the French word for kind, sort, style. Before we visit with genre, let’s examine how the use of (or lack of) truth affects pieces. Maybe truth will offer clarifying ideas. Here’s a simple chart looking at truth in our genres. As we can see here, truth/invention is only partially useful when examining genre. Truth/invention works great with creative nonfiction and fiction but doesn’t work at all for poetry and drama. So truth doesn’t clarify enough for us. It leads to more confusion. Next, let’s examine the keys to figuring out what makes a genre a genre. Genre What Makes It a Genre? Though this chart is simple, it’s also confusing. Two of our genres deal with truth or lack of truth (fiction and creative nonfiction) plus shape (paragraphs). Two deal with shape (line breaks or playwriting). So we are no farther along. Genre is unclear (because two of the genres focus on truth and two focus on shape) and truth is ineffective because two of the genres don’t care about truth. Teacher: Points to illustration. Looks confused. Tries to explain how genre and form works. Sputters. Erases work. As a professor, I get stuck trying to explain genre and truth to students. As the writer of a textbook, I get stuck trying to explain genre and truth to readers. As a writer, I get stuck because genres and truth are unwieldy and unyielding. What if I want to write creative nonfiction in poetry form? What do we call that? Essay? Memoir? Poem? If we call it essay, we wonder about shape. If we call it poem, we wonder about truth (or lack of truth). We need to move to a system that offers rational borders and removes the false limitations that have been set on our genres. What is the solution to this overlapping confusion of genre and shape? Let genre teach us only the shape of a piece since the term genre originated to mean style and never was meant to include fiction or truth. Maybe this problem originated with the invention of the term “the fourth genre” for creative nonfiction. Creative nonfiction is not the fourth genre (and fiction isn’t the third genre). Rather, prose is the third genre but before creative nonfiction became popular, fiction was seen to equal prose. Now we see fiction and creative nonfiction as genres rather than as types of prose. Once we have moved to three genres (poetry, drama, prose), then let us create a new category that deals with truth or invention. I propose veracity. Definition of Veracity: The observance of truth, or truthfulness, of a thing, something that conforms to truth and fact. Etymology of Veracity: From Latin, meaning truthful. So we will have two (or three) veracities. Veracity only teaches us about the truthfulness or invention of a piece. And let us have three (or four) genres. Genres will only teach us how a piece will look on the page. Genre What Makes a Form? Habitat: Lives in areas of sunlight populated by truths, facts, memories, and speculations. Location: Can be found in prose, poetry, and drama. Appearance: Carries the appearance of the writer’s life or the life of those who the writer has studied. Times: When the writer wants to examine the factual, the truth, the real in a moment. Habitat: Lives in caves populated by invention. Appearance: A changeling. Can appear like the writer, like other humans, or entirely unlike humans at all. Times: When the writer wants to create something new, when the writer longs to invent. Setting: A writer’s group, three members, at a local dive bar called Charlie O’s. Practicing a new way to view genre and veracity. Jess: So what would you call Anne Carson’s The Glass Essay? What does this new system allow that sees genre as poetry, drama, and prose? That offers a scale for veracity of a piece? Either true, invented, or something hybrid (veracity). Either poetry, prose, drama, or something hybrid (genre). We can go back to calling a cardboard box a box and a house a house. Two: It allows writers flexibility to conceive of how they should write on the page. Writers may no longer need to feel constrained by genre and veracity because we’ve separated truth and fiction from genre. Three: This system allows publishers a way to clearly articulate what they want. Again, just choose a genre(s) and a veracity(s) and the writer will know what to submit. Four: This new system instructs the reader more clearly on what they will receive. The contract is clear between writer and reader. Veracity teaches us about truth/invention. Genre teaches us about shape. I am an essayist. But I see my truths, attempts, tries at understanding life not always in the long paragraphs of prose. Sometimes my brain, heart, hands need, yes, other forms. There exist hundreds of definitions for poetry. Most offer major flaws in how they categorize poetry. The only definition I have found that doesn’t have major holes (because of its simplicity) is that poetry, almost always, uses line breaks to determine the shape of the poem. Except when it’s called ‘prose poetry.’ And once again, the professor looks confused. My friend Karen just said that she reads most poems as “real” or “based on the writer’s life.” I read most poems as invented by the writer. We, the reader, have no idea if a poem is real or invented. Hybrid texts intentionally blend fiction and nonfiction, play with fiction and nonfiction, or have fiction and nonfiction share space. We can continue to work to decide where the hybrid boundary begins and ends, but it seems that the hybrid space could be reserved for pieces that mix or play with truth and fiction. We decide on fiction and prose because the heart of the novel is about the invented story not the nonfiction on whaling. We’d still need to work out some kinks (like where to place In Cold Blood), but the kinks are smaller and on the edges of the borders. So rather than dealing with major issues in how our genres and shapes overall and confuse, we’d have to deal with smaller borderland issues like Is IN Cold Blood nonfiction or hybrid. Sean Prentiss is the author of the memoir, Finding Abbey: a Search for Edward Abbey and His Hidden Desert Grave. Prentiss is also the co-editor of The Far Edges of the Fourth Genre: Explorations in Creative Nonfiction, a creative nonfiction craft anthology. He lives on a small lake in northern Vermont and serves as an assistant professor at Norwich University. I used to say write like everybody you know is dead. It was my signature phrase, a gentle cudgel used to subdue the kind of self-questioning fear that often stunts a writer wading into uncharted waters. An exhortation to write wild, brave and free. Of course this was also when I wrote mostly about the living, when I wrote about the dead primarily as a passing referent, a milepost on my narrative journey. After my grandfather died. Before my grandmother died. When my cat, or aunt, or grade-school choir director was still alive. Mostly I wrote about those who would never read my words. I didn’t worry about my mean-spirited (but true!) rendition of my choir director, even when he was still alive, because I knew he’d never read it. And on those rare occasions when I did write about the dead, I wrote mostly flattering things, gentle odes to those passed on. But when a longtime friend shows up in your newly-adopted state and drinks himself to death in your presence—a real-life Leaving Las Vegas played out over several weeks—then you will write the dead. The imperative of knowing, of witnessing—whether it be for atonement, or to honor, or to punish—you will write the dead. I am still writing the dead, although the story has trickled out on me at ninety pages—too short for a book, too long for an essay. An Essayvella? Last summer I started writing by hand again, scrawling away in a gray composition notebook. Perched on the balcony of our carriage house apartment, surrounded by my potted palms and tropical plants, I let the summer breeze lull me into believing that I was playing the part of Hemingway in Key West, rather than Appalachian Ohio. I hadn’t written with any serious intent in a notebook for six years, having finally trained myself during my MFA program to “be creative” on my laptop. I had been cursed with a stubborn certainty from the earliest years of my literary dabbling: a certainty that one could not—or at least I could not—type creatively in the same manner as I scrawled my barely-legible notebook odysseys. But after a decade of writing longhand, and then turning around and typing those words into a Word document, my wrists were perpetually sore, and my forearms plagued by a recurrent tingling numbness. Fear of Carpal Tunnel Syndrome, of a hand clenched into a useless claw, scared me enough to alter my habits. So I pushed on past my ingrained superstition and discovered that in fact I could conjure expression from the percussion of my fingers on the keys. And every muscle and nerve from my knuckles to my shoulder blades thanked me. Part of my decision to return to writing longhand was about trying to rediscover the joy of writing I used to know before I was a “Writer.” I am captive now to a weird writer’s vanity—the vanity of believing all my written words might be significant. It’s an absurd idea. I still generate far more future trash than I do marketable prose. But I no longer feel good “free-doodling.” Writing has become a commodity, or more accurately the time I have for writing is a commodity, and thus I feel the pressure to make that time count. Each word part of a sentence, part of a paragraph, part of a final essay to be submitted, part of a book of said essays to be offered up as sacrifice to the capricious gods of publishing. By getting “serious” about writing, I robbed the act of fun. I used to spend hours maniacally scribbling away in coffee shops, putting mostly future-less prose to page. Sure I was going to be a writer someday. But I wasn’t there yet, and my 90s daydreams of writer greatness were barely more realistic than my previously imagined futures as a rock star or NBA power forward. Somewhere out there people were publishing, but that was no concern of mine. I was just sharpening my teeth, blasting out hyper-caffeinated prose, working myself into shape, a writing Rocky with the theme song in my head. I wrote the dead swamped in grief. I wrote in regret. I wrote in anger. Lambasted myself on the page for being unable to save my alcoholic friend. Lambasted him on the page for being unwilling to save himself. I wrote in forgiveness. I wrote in love. I wrote in remembrance. As the years scrolled by and the death receded back in the rear-view mirror I wrote with increasing detachment, when I wrote him at all. The tidal wave of early words slowed to a river, then a stream, then a trickle. I had said all I could say, disgorged my pages and turned instead to dabbling with rearrangements, trying to make the puzzle pieces fit into some semblance of a whole. I missed his April birthday this year, for the first time since his death. Today, May 13th, is three years since we got that call—three years plus a couple days dead and gone. The past is malleable; we shape it and polish it until it resembles what is most palatable to our current selves, and our reflection of those previous incarnations. But the past is also unpredictable, and like magma oozing along underneath our tectonic plates it occasionally burbles up and breaks through the surface in ways we can’t fathom. Early October, the mid-George W. Bush years, waiting for a train at the Milan airport. It had been six years since that summer in Holland, my brief interlude as romantic expat abroad, and yet waiting for the train I could feel the swell of nostalgia and sorrow bursting up from a long-dormant core, spurred by the simple fact that it was the first time I’d been back in Europe since those events. Melancholy seeping from my pores like magma, and a visceral certainty that I could punch through the wall of the tunnel to find that other me, that other past lurking in shadows just outside the corner of my vision. I think part of the allure of blogging is not just the immediacy of your words, the timeliness in response to current events, but also the immediacy of the self. This is who I am, right now. This is my life, my ideas, my brain on the page at this moment, date-stamped for perpetuity. This is the real-time wine and wafer; eat and drink and be one with me. Because even in the quickest publication turnarounds there is normally a lag-time of months or sometimes years between those words you wrote at that moment when they were fully you, and the day those words go public. By the time my words see the light of day I am often tired of them, having rolled the Sisyphean literary boulder up the hill, writing, shaping, re-shaping. And then you see those words from this lag-time, where they are always that younger you, always a slightly different version, so that in reading yourself at the moment of publication you are reading your own history. Some of my oldest Word documents pre-date the Millennium. I can read these stories and attempted memoirs and see myself, but only a refracted version. In a sense I reclaim my history every time I reread them, which is why it is simultaneously exhilarating and frightening to read those old pieces—or to delve into my old journals, which date back nearly a quarter-century. In the intervening decades those memories were sanded down and sun-bleached, but then I will re-read that passage from the journal of an angst-ridden 19-year-old and be viscerally reminded of who I was then, of that younger, smaller me that still exists in this older form, still forms the inner rings of the tree of me. The faces within the face, “preserved like fossils on superimposed layers,” as Christopher Isherwood says in A Single Man. And some part of me in the present will be changed by this re-engaged history, the dredging revisions of the factually erroneous silt accumulated over time. 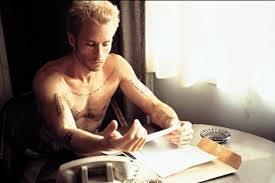 Aren’t we writers, particularly we Nonfictioneers, just like Leonard Shelby, the protagonist in Memento—who, having lost all short-term memory, must constantly reconstruct himself from his scrawled notes? Those important truths tattooed all over his torso, never to be forgotten. Aren’t we writers tattooing ourselves every time we publish? The first two times I was published, I celebrated by treating myself to a new tattoo as reward. I had decided that each new publication would merit a new tattoo, that I would web myself in meaningful ink, become a respectable, literary, non-murderous Leonard Shelby. But I haven’t kept up that tradition. I meant to, but as subsequent publications happened I realized that they were not all of equal significance, and probably not all worthy of their own ink. And I had other things to spend money on, other people to consider. Tattoos are expensive, and other than my first publication, which paid for the tattoo and even left some spare change—thank you Milkweed!—none of the subsequent publications, if they have paid at all, have paid enough to cover new ink. I have moved on, for the moment, to writing the living. Writing a book about my biological father, or more accurately about our relationship, and what it meant to grow up with a gay father in the 1980s during the height of the AIDS crisis. This is a story I’ve always known I had to tell, one that friends and professors alike have chided me for delaying. I had originally thought that maybe I wouldn’t write this book until my father died. That maybe out of respect for him, I ought to wait. But I realized something important, in the process of writing the book of the dead friend: it isn’t easier when they’re gone. In many ways it’s harder. What you might think of as the advantage of avoiding those awkward moments—they’ll never read it—are offset by the guilt one feels for writing them without the possibility of correction. Of being able to say anything you want. Of presenting their likeness without consent. Part of me fears certain passages I’ve written already about my father, things that will surely hurt him to read. Part of me also fears the passages I haven’t written yet, the stories I’m slowly working myself up to, the ones I can’t imagine having a conversation with my father about. But we can do that. We can talk. And maybe in talking about these events, the stories themselves will become better, truer—more purely Nonfiction—as we hash out the differences in our memories to find a palatable shared truth. Isn’t that much more likely to be true than my singular version of events? Isn’t that more fair, more honest? Those old Microsoft Word documents are in danger of becoming outdated, of living past the current technology’s ability to reach back and speak to them. It’s weird to think about because we always assume that technological improvements are without consequence, inherently positive. But of course with each passing year the incentive diminishes for the engineers at Microsoft to make sure that the newest version of Word is still configured to be compatible with antique, pre-Millennium versions of itself. And I keep ignoring the compatibility messages when I open one of these ancient scrolls, confident in the fact that we no longer live in the dark ages of technology when Apple and Microsoft spoke separate languages, warring across a tech channel like the French and the British. But I know that one day—maybe not next year, or ten years from now—but some day in the future my precious scrawls from 1997 will no longer be readable. Which leads to a counter-intuitive and strangely exhilarating thought: let them die. Delete all. Delete them all. Like John Steinbeck burning The Oklahomans—his first attempt at The Grapes of Wrath—and starting over from scratch. Imagine the weightlessness of returning to a blank slate. Of digitally burning everything not already in print. Of saying thanks for all the practice, now toss those canvasses into the bonfire and begin anew. What if we could start over? What if we could erase everything we’d ever written, and truly forget? What would my next sentence be if I knew I would never re-read my old words?